Fabulosa colagem!! Hugs my friend. this is excellent, jennifer ... fine work !!! A good creation again !... with lovely colors too ! Wish you a nice week end, Jennifer. Une superbe réalisation très significative ..++++++++++Bonne fin de semaine. 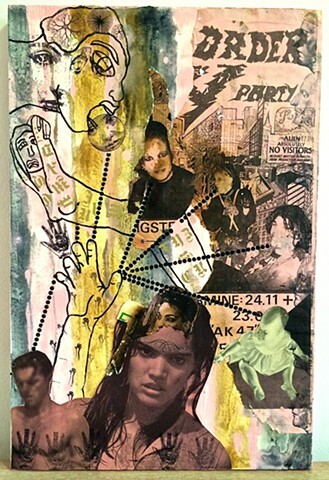 Lovely artwork and collage of many different things, including people Jennifer! Fabulous creativity and so beautifully presented! Marvelous colour composition and wonderful details too! Excellent collage et composition .... bravo ! we need more billboards like this one...Bravo! Your work never ceases to amaze me Jennifer, another superb creation. Wonderful and well done, as always , my dear friend !! Have a happy Sunday , Jennifer ! Beau travail créatif jennifer bravo ! This is an excellent, great work my friend !! Have a nice day. Du hast tolle Ideen und grossartige Collagen. I imagine this as a movie poster, a movie I'd like to see...I think:) Very creative and very well done, again. Very interesting and nice creation ! Well done, Jennifer ! not only a collage, this is a story telling artwork ! have a great week ahead my friend! Brilliant and creative collage here. Well done Jennifer. Regards Tess. Always so very creative and unique...fantastic! Extreme Creativity ... congrats, well done! Awesome art, Jennifer! Really love this one!